Muncie native John Smith has always been a family man. The proud father of nine now-grown children, he recalls many very busy years when he and his wife, Jeanne were raising their kids, and he was running the family business, Mid-West Metal Products. However, as things began to slow down, he says he started to think about ways he could serve a much larger community. To that end, they established the Jeanne and John Smith Fund in 2006, designated specifically to assist low-income families in acquiring basic human needs of food and shelter. He chose to work with The Community Foundation because he trusted its positive impact based on solid research and good will. Later, he and his wife established a second, unrestricted fund through the Foundation, which received the benefit of a 100 percent match from the Lilly Endowment. 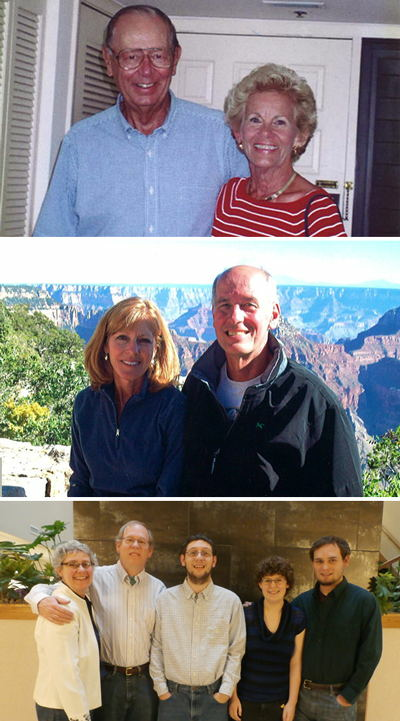 In addition to earning a match, The Community Foundation has provided the Smith’s with multiple ways to give. John has made donations in cash, via credit card, through appreciated assets such as stock, and through a gift of real estate. Additionally, John is a member of the Foundation Legacy Society, which means he has included The Community Foundation in his estate plan. His acts of generosity inspired John’s children to follow in his footsteps. His son, Steve Smith, and wife Barbara established three separate funds with the Foundation. John’s daughter, Carol Ross and her family also worked with The Community Foundation to establish the Ross Family Autism Scholarship Fund in 2011, designed to provide financial aid to students with autism. There are a number of ways to donate to The Community Foundation of Muncie & Delaware County. All of them can create change for the better. Recognizing dedication to our community's future. A gift that grows with time. VISA and MasterCard donations are accepted on the give now page. A $25 minimum gift is required using this convenient online method. Many people own long-term, highly appreciated real estate they no longer use or no longer want to manage. In many cases, owners are looking for tax-efficient ways to pass the property on or convert it into an income stream. If you are one of these fortunate property owners, you may want to consider how philanthropy can unlock earning potential, create tax savings, and make an important difference to our work. The most popular way of providing long-term support for a meaningful charitable organization is to make a gift in a will. With some foresight, you can make a gift in your will that fulfills specific planning goals as an integral part of an estate plan. Through a gift of grain, you avoid including the sale of grain in your farm income. Although a charitable income tax deduction is generally not available, the avoidance of declaring the income may be a significant benefit. A charitable lead trust allows a donor to name The Community Foundation and other charities as beneficiaries of a specified percentage of income from a trust for a set number of years. Ultimately, the bulk of the trust reverts to other named beneficiaries, such as children or grandchildren. A charitable remainder trust offers a triple advantage. First, you receive an immediate tax deduction for a charitable gift. Second, assets are removed from your estate avoiding future estate taxes. And third, you or someone you select can receive a lifetime of income from your gift. A charitable gift annuity is a popular and simple way to contribute to charity and also receive an income, which often allows donors to make larger gifts than would otherwise have been possible. Transferring a private foundation will preserve the identity and purposes of the original donor and family members. There are no taxes to pay and The Community Foundation assumes all administrative responsibilities. Additionally, a private foundation transfer offers flexibility, administrative savings, bi-annual reports and automatic annual audits. You have the satisfaction of knowing a permanent organization is in place to carry out your wishes in the future.